The heels are wedge heels. They look really comfortable. THESE ARE NICE SANDALS YOU WOULD BE PROUD TO OWN. These sandals are much prettier and nicer in person than in the photos. These shoes are pre-owned, but only worn for an interview. They are in excellent condition with minimal signs of wear. Stilettos High Heels Lace Up Shoes Suede Brown Leather Womens Size: 9 NEW! 6 3/4" long heel to toe5" spike heel and 1" platform with tractor tread soleSilver hardware, super long red laces. Xhilaration brown faux suede hiking boots. Faux suede upper. New w/o box. We will reply you ASAP. BROWN LEATHER LIKE KNOTTED SANDAL. Great value! Shoes do not appear to have ever been worn. Versatile styling, perfect for any occasion. Finished with lightly padded insole for your comfort, ankle clasp closer. Heel Height: 5.25" w/ 1.25" Platform (approx). Color: Black w/Gold. BY XHILARATIOR. HAVE A RUFFLED LOOK IN FRONT. THEY ARE IN. THEY WILL BE IRONED, BUT WE CAN NOT GAURANTEE THEY WILL ARRIVE THAT WAY. THEY DO SO MUCH FOR THE CHILDREN AND FAMILIES AND IT IS ALL FREE TO THEM ! The toes are round, the shoes is open. Style: clog mule heels. Material: ALL LEATHER. 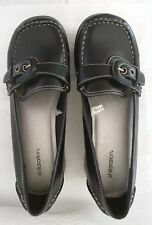 Woman's Shoes - Xhilaration brand - Size 9. Condition is Pre-owned. These shoes are in very good condition! Shipped with USPS Priority Mail. Color: Butterscotch. 1" wedge nonskid heels. Lazer cut out pattern on the upper shoes. Toes, upper trim and bow are done in patent.remainder of the upper shoe is smooth leather like material. You are our number one priority and we will work diligently to take care of you. Condition: Great condition. Gently used.